We have multi-machine deployment that we are trying to make highly available. 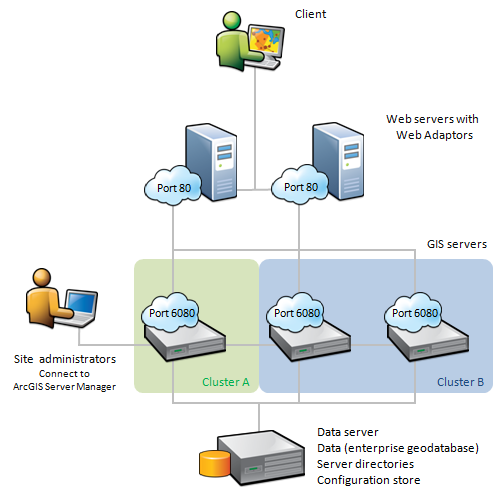 Two Web Servers, with Web Adaptors both pointing at GIS Site that has 6 GIS Servers. When configuring the Web Adaptor, we use the URL to one of the GIS Servers in the Site. All well and good to this point. We would like the web adaptor to be able to continue working when the server, configured with the web adaptor, abruptly goes offline. However, after testing, when execute a shutdown of the server that the web adaptor is registered with, I am no longer able to get to view/access any of the GIS Services? - Is there anyway to configure the Web Adaptor to continue working under this scenario? - Seems like a single point of failure in the system. Have you a similar scenario? where have you configuration store, service directories and data? I have the config-store on one of the servers in the stack. It is a shared directory. If I offload the config-store to another resource, independent from all GIS Servers, will this allow the web adaptor to maintain contact with the remaining services? I will test with the separated config-store. Thank you. I reconfigured my site so that the config-store and all arcgis server directories configured on the site are on a separate machine. You were correct. This fixed the issue. Now, when I take down my arcgis site machine, the web adaptor routes the requests to one of the remaining available GIS Servers in the site.